Well, the actual relocation part of my moving is done and I'm happily in my new home in my new city. Now, if only I could just snap my fingers and have all the boxes unpacked, the crafting room all organized, and the fur-babies all adjusted to the new digs. Ah, well -- good to have something to keep me occupied. The image is "Gertie Goose - Fall" from Imagine That ! !, given to everyone who played in the progressive challenge last month. I'm barely getting it in before the end of this month and I'm so grateful I had it photographed before last weekend. Now I won't miss the challenge over there. Everything on the card came from left over scraps, including the trim and the papers. Both the image and the mat were cut with dies from Spellbinders, and the bow is one of those I make up by the dozens. I did the sentiment with a computer font. Oh, just to finish the story -- having no idea which box is holding the elusive camera cable, I was smart enough to get online and do a search for a store that had another one. I found it quickly (although in a state halfway across the country), ordered it, and it should be delivered early next week. Thank goodness for that. Now I can take time away from unpacking to create a few things, knowing that I can post them within a very short time. This was one of the last cards I got to make before all the paper crafting supplies got boxed up for the move and I'm proud to say that it's my Guest DT card for this week's 'Anything goes' challenge at Scribble & Scrap. 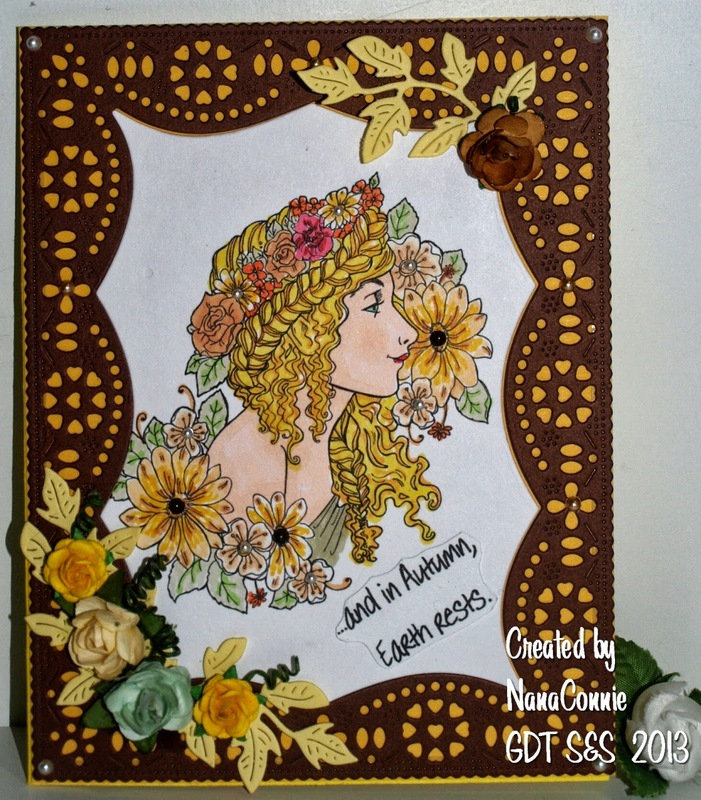 The image is a magnificent one from the Scribble & Scrap shop called "Vintage 3." If you haven't been to the shop before, you really should go explore it. More is being added all the time. and the colors are from There She Goes. Isn't she marvelous? Maybe it's because fall is my favorite season but I thought she'd be perfect done in muted fall colors. Of course, I can see her done up in spring pastels, too, or even summer brights. This time, she's colored with ProMarkers and then die cut with that magnificent Cheery Lynn frame. I did two cuts with that die; one on the image (the white) and a second cut on brown CS. I fit the white image piece into the brown frame, then matted it with pumpkin CS. The leaves are also from a Cheery Lynn die. All the flowers were in my stash. I added pearls to the corners and a few places on the frame, plus in some of the flower centers in the image. They don't show up as well in the photograph but IRL they just shine! On this card, I used an image from Lacy Sunshine, "Candi Corn Sticky Wings", and I think she's just adorable! The theme for their challenge is "Stitching, real or faux." and the colors from the challenge at Color Throwdown. The image is colored with ProMarkers and I used glitter gel ink on her wings. The embossing folder is by Cuttlebug but I don't remember the name of it. I've had it at least 2 years and this is the first time I've used it (hanging head in shame.) Papers came from my 12 x 12 scrapbooking papers and they just really worked for that color combo. The sparkly bats were in my stash from last year and the bows are some of those I sewed up myself. In the midst of everything else going on in my life (sorting, packing, moving), I was invited to be a Guest Designer for Whimsy Inspiration's challenge this week. It goes live today at noon Eastern time so my post is a couple hours early but this was when I could get it linked up so... I guess you get a quick preview of the theme. I've played in their challenges so often over the last year or two that I just couldn't say "No." :-D The theme is "Shabby Chic/Vintage" and I immediately thought of that lacy die cut frame when I saw this image in the Whimsy Stamps store. 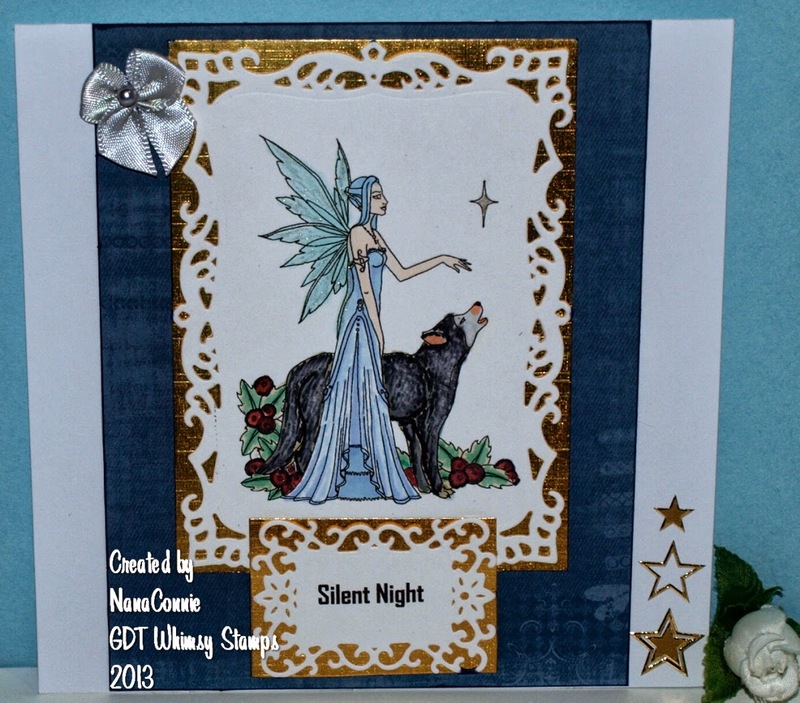 It's called "Silent Night," perfect for a Christmas card and lovely with a vintage-y look. I know vintage is usually piled with flowers, lace, and glittery embellies but I didn't want to cover up the stamp. I thought the frame was enough and I just did my best to balance CAS and Vintage. I based this on a sketch from Sketchbook Saturday adapted for a square card. I know there's a bit of an angle to the photo but I used gold, metallic CS to mat the image and sentiment and it gives off a terrific glare in a straight-on shot. The image is colored with ProMarkers and sparkle gel ink on the star and on her wings, although it's hard to see because of the angle. I die cut both the image and the sentiment with frame dies from Spellbinders. The bow is one of those I make by the dozens (hand sewn) and the star embellies are metal and enamel brads. The blue background dp is from DCWV's Juniper Berry stack. I'm so excited to announce that I was invited to join Beccy's Place as a Guest Designer for a blog hop that is being done by Sparkle N Sprinkle, where you can find many of Beccy's images. 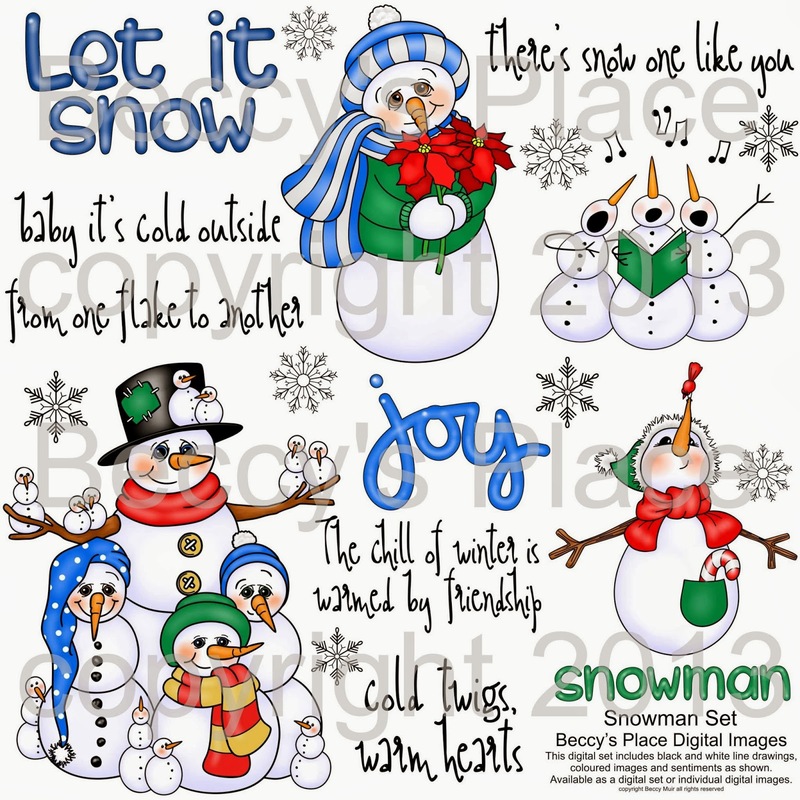 Today the Beccy's Place designers have teamed up with Sparkle N Sprinkle for the release of the new "Snow One Like You" set of images. The girls over at SNS have been working with the rubber stamp version, while we have been using the digital set that contains a couple of additional images. Keep reading to learn how you can win one of Beccy's digital sets! The digital set is available for purchase from Beccy's online store. Here is the card I created using the set. I went a little wild with the circles but that just makes it a "well-rounded" card, right? I used ProMarkers to color the image and added glitter to them and to the ice for a bit of sparkle. 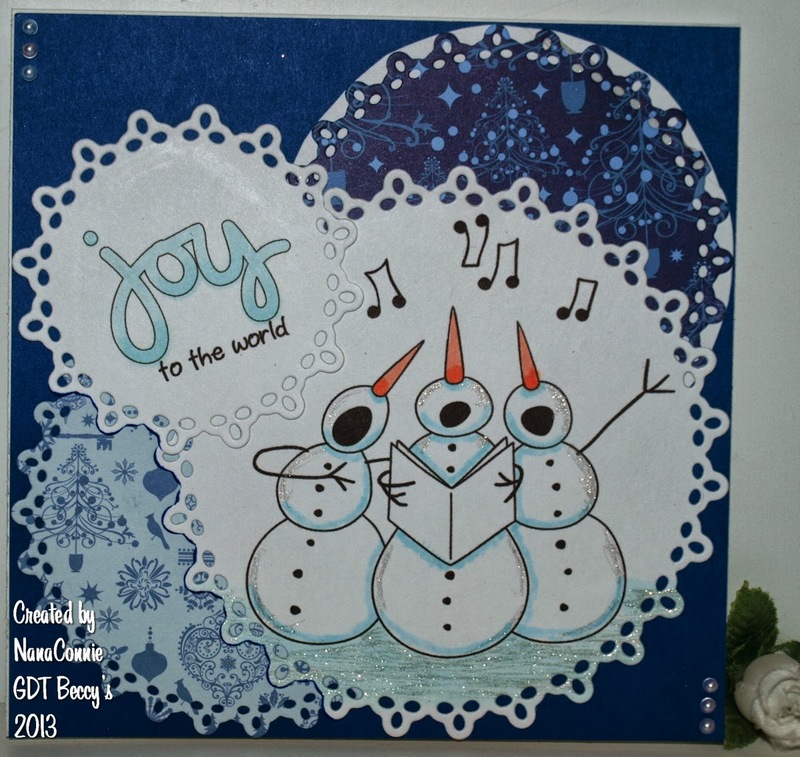 I used the same shades of blue to color the "joy" in the sentiment. I die cut everything; image, dp, sentiment, then layered everything onto a sapphire blue card base. 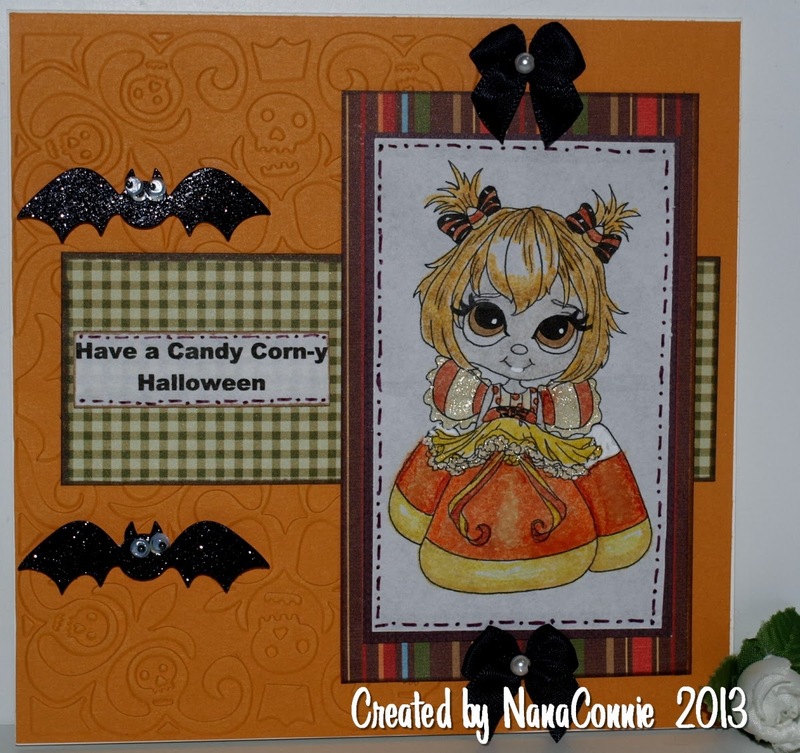 I added pearls to the corners for embellishment and then left it alone. I thought the papers were busy enough that nothing more was needed. 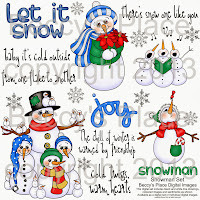 Beccy is giving away three sets of the "Snow One Like You" digital stamps. All you have to do is leave a comment on one of her designers blogs during the hop. Three random comments will be chosen and those people will receive the full set of digital images. You can leave a comment on as many of the designers blogs as you like... visit them all to increase your chances of winning!